Steam train crossing as onlookers leisurely enjoy the vista. Postmarked 1921. Even with sophisticated modern equipment, bridges are marvels of engineering skill. 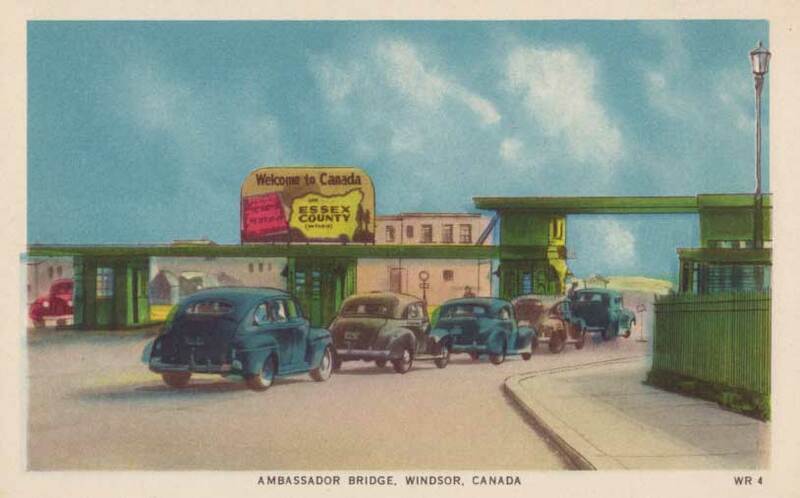 Bridges from earlier periods, such as the array of Canadian ones featured on these vintage postcards, built without the benefit of such conveniences and often at the cost of many lives and injuries, are that much more impressive! Heading into Canada from Detroit. About 1940s, when cars featured many curves. Love the simplicity of this image and the partial reflection. Postmarked 1906. Another bascule bridge with a small boat passing under. Early 1900s. This bridge is close to the one photographed in an earlier post on my blog near Clementsport, N.S. About 1951. This is an amazing suspension bridge! Lots of boaters around this one. Postmarked 1921. About 1920s. Nice old water tower at other end. The Princess Elaine was built in 1928 for the Vancouver Ferry System and was a jewel of the ferries at the time. Postcard is about 1930s. About 1940. Non-traditional focus for a bridge image. Neat old auto coming toward the viewer. About 1920. Less well-known and more secluded than the Capilano Suspension Bridge several miles away in Vancouver. Lovely simple scene in New Brunswick. Another view of the Pont Gouin in St. Johns, Quebec. Postmarked 1939. Reverse of the Victoria Gorge card in this group. Postmarked 1921. Like the line: ” . . . if I only send cards please don’t be cross. It’s hard to write letters.” Only a name and a town were needed for an address. 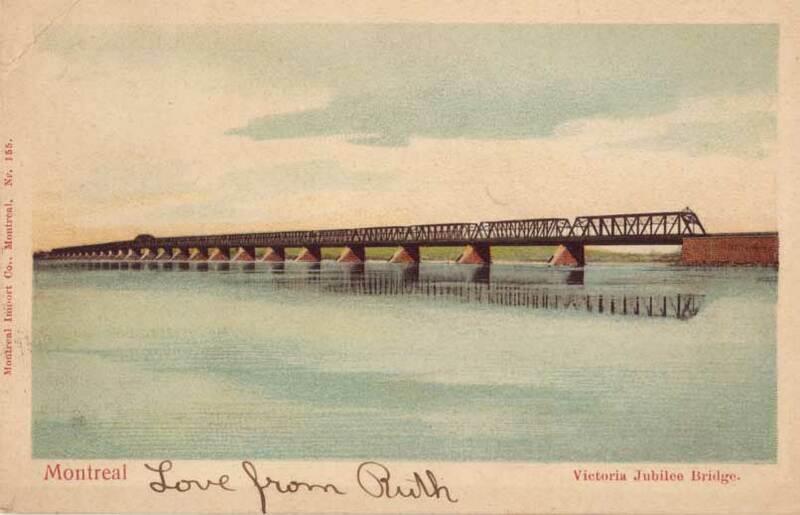 • Beautiful Old Railway Bridge, Near Clementsport, N.S. Great selection. I love bridges. I love bridges! On my last trip to Montreal my husband and I spent an evening walking on the Champlain bridge and taking shots of the canal and La Ronde below as evening fell. It was amazing. Great collection of postcards! Leslie, thanks. Sounds like a wonderful time in Montreal! Nice to meet someone who appreciates the technological marvel these bridges continue to represent – and a great post too! Thanks for stopping by my blog, and I’m looking forward to seeing more from you! Oh these are lovely! I have to admit my bias though – Your first postcard from Edmonton! That’s “my” bridge – I cross it almost every day – and she is a grand old dame. I think in many ways, the High Level Bridge is a defining image and place/thing for this city. Thanks for sharing it with the world! Thanks Brett, she’s got a storied (and not altogether happy) history, but nonetheless – one of the iconic and defining elements of the city. If you haven’t already, take a trip on a vintage streetcar across the High Level! 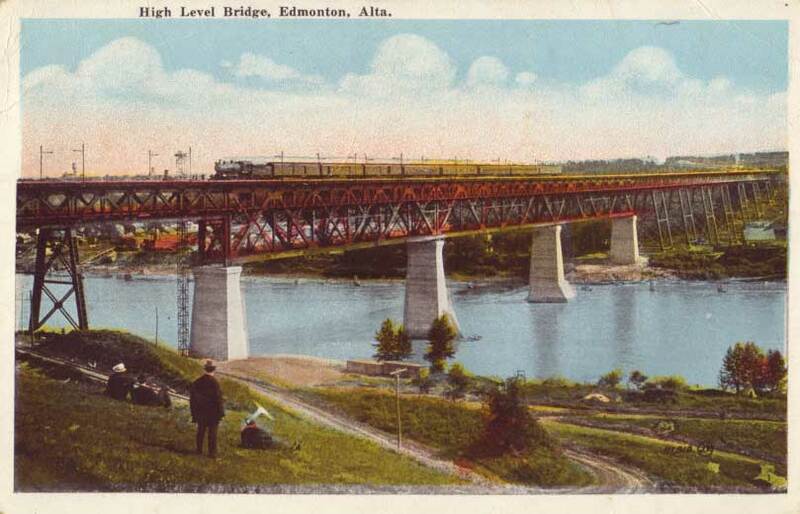 It’s a fantastic view of the city; the (volunteer) Edmonton Radial Railway runs the streetcars from May until October. Those old-school gangster-look cars make the pic! Love the handwriting on the postcard. Nice post. I have been across most of these bridges. And Edmonton’s High Level is visible from my windows.